A new study on ants and robots has shown that having more workers is not necessarily better when working in confined spaces. If there are too many bodies then the workspace can get clogged. A less busy approach in which some workers are purposely idle can avoid jams. The findings might help devise strategies to avoid clumping in confined and crowded environments, such as disaster relief operations. Prof Daniel Goldman, a physicist and robotics expert at Georgia Institute of Technology, has been studying invasive fire ants for eight years, since he realised that understanding how they cooperate to dig tunnels could have real-life consequences for robot design. The new study has shown that sometimes a laid back approach can get the job done. 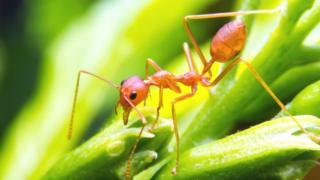 Unlike cars that clump together or buses that arrive at the same time, ants rarely seem to have traffic jams. Prof Goldman said: "We painted the abdomens of ants with oil-based markers and by monitoring which ants showed up in the tunnel, we found that in fact about 30% of the ants in a group did about 70% of the work, because they came to the tunnel more often and they excavated more pellets." He added: "We wanted to know why only about 30% of ants were excavating, and to understand how basic laws of physics might be at work." It turned out that the inequality in ant labour is not because the hardest working individuals have a specialist "qualification" in tunnel engineering. In an interview with BBC News, co-author Dr Daria Monaenkova said: "The most active excavators were identified and then removed from the group. Surprisingly, several other group members took the place of the removed diggers. For us, this was a hint that unequal workload distribution may be beneficial for the excavating collectives." Prof Goldman added: "We found a functional, community benefit to this seeming inequality in the work environment. Without it, digging just doesn't get done." Comprehending how ants avoid crowding and work efficiently to dig tunnels could aid understanding in situations where there are no traffic police, and the individual "drivers" - whether ants, robots or people - are working with limited knowledge of others in the group. To see if the same theories might also apply in a real-world setting, the scientists built robots that could excavate the high tech equivalent of a children's ball pool. The team were interested in discovering principles by which swarms of robots can perform tasks in cluttered landscapes in which they might collide and bang into each other, hindering their ability to move. Using an "eager" strategy, the robots got straight to the job, but quickly became entangled in each other. If the robots were able to reverse out without taking balls, then then this worked well. However, a "lazy" strategy worked best in terms of energy consumed and rate of digging. Dr Jeff Aguilar, who tracked and analysed the robots, commented: "The most interesting thing was this idea that if you are lazy then in certain cases, that is actually better." He added: "What's different with robots is that it turns out that if you don't use strategies such as reversals and unequal workload distribution, then robots perform more poorly than both ants and theoretical models. Because we are only just beginning to get sophisticated controls and agility on the robots, it is even harder for them to get out of jams." In comparison to robots, ants have evolved sophisticated social rules to avoid the problems that can occur when you have a lot of individuals in a crowded environment. Prof Goldman told the BBC: "If there is a natural disaster of some sort, then the robots could manoeuvre through complex tight spaces. If they all tried to go at once, then they could become entangled. Down the line, I think that we will have robots that are 'terrestrial' capable, where they work in teams. Some of the principles that we learned in this study could be applied in these circumstances." In the future, Prof Goldman would also like to understand how ants develop the most effective strategy, and then apply this to figure out if you can make groups of robots learn the best strategies.